I have followed Sue’s career as a portrait artist with interest and admiration for the past year. Knowing how talented she is, I needed a good reason to commission a piece myself. A portrait of my nephew at one year old on the occasion of my sister’s 35th birthday seemed like the ideal opportunity. Finding a good photo was difficult as most of the photos I have of him smiling are also blurred due to him moving; at 12 months, he has not yet learned to pose. However, I collected my favourites, and a few from my sister and worked with Sue to choose the one that would work best as a portrait. During the creation of my portrait Sue sent me photos to keep me up to date with her progress and to check I was happy with it. This was something I was not expecting, and made me feel more in control and even more confident that I would be happy with the result. She even made slight adjustments at my request, and suggested a couple of amendments to picture to improve the composition. This in my opinion is the beauty of a a drawn or painted portrait over a photograph. Seeing the finished article as a small photo on my screen really did not do it justice, and I couldn’t wait to hold it and look at it in person. I wasn’t disappointed. The result is a truly beautiful portrait of my gorgeous nephew, with a likeness absolutely true to life. I presented the portrait to my sister at a family gathering where there was no doubt amongst any of the guests as to the subject. The picture was universally admired by aunts, uncles, cousins, grandparents and most especially his parents. 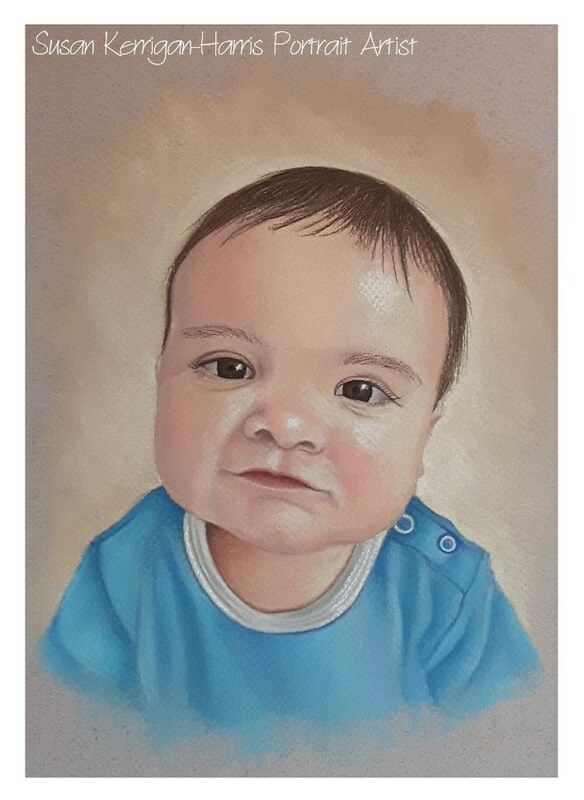 Perhaps the best testament was when my sister held the portrait for the first time, her son (who does not like his parents to hold other babies), seeing her with ‘another child’ in her arms, cried to be picked up instead!